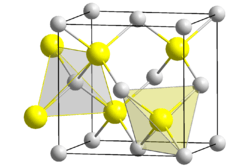 Beryllium sulfide is an ionic compound from the sulfide group  with the formula BeS. Beryllium sulfide powders can be prepared by the reaction of sulfur and beryllium in a hydrogen atmosphere by heating the mixture for 10-20 minutes at temperatures from 1000-1300 °C. Alternatively, it can be prepared by the reaction of beryllium chloride and hydrogen sulfide at 1150 °C, though this reaction will leave chlorine impurities. 1 2 3 "NIOSH Pocket Guide to Chemical Hazards #0054". National Institute for Occupational Safety and Health (NIOSH). ↑ Kenneth A. Walsh (2009). Beryllium Chemistry and Processing. ASM International. p. 127. ISBN 087170721-7.